BE CAREFUL. While many doctors, foreign and French, citizens, patients sometimes victims, have been trying to inform for many years about the uselessness and the risks of the vaccine against papillomavirus, a new offensive of the pharmaceutical lobbies led again some deputies to try to introduce it into the law of compulsory vaccination, already probably the widest in the world. We have analyzed the benefit-risk of this vaccine originally intended for women, but boys are likely to be targeted  as well, and denounced several times  its uselessness coupled with its risks. in both women  and men. The time that has passed since the FDA issued its marketing authorization in June 2006 only makes new arguments against this vaccination, the strongest of which is the increase in the number of cervical cancers in the most vaccinated populations, which should encourage these countries to follow the example of Japan and Austria and to delete the recommendation. France is world champion in vaccine obligations. But in this area, the lobby of useless and potentially dangerous care always wants more. Thus 8 deputies  have just introduced a bill to create an additional vaccination obligation against papillomavirus . And the very recent Elyos dinner between the president and the representatives of the pharmaceutical giants is not there to reassure us. [8). “PARIS (Reuters) – Thirty leaders of the world’s largest pharmaceutical groups will be received Monday by Emmanuel Macron for a dinner dedicated to the attractiveness of France, before a Strategic Council of Health Industries Tuesday. “It’s a bit the ‘Choose France’ pharmaceutical industry,” said the French Presidency, referring to the summit of attractiveness organized last January with some 140 leaders of multinationals. (…) Matignon noted in October that the sector represented 300,000 direct and indirect jobs and 53 billion euros of turnover in France and that it contributed positively to the trade balance for 7.7 billion euros “. The preamble to the bill is based on the usual arguments of pharmaceutical companies widely disseminated by the media  and their comfortably paid experts such as Dr. Monsonego  or Professor Descamps . This preamble certainly recalls some indisputable true facts: there are more than one hundred HPV strains, the vaccines possibly protect against infection by the 4 to 9 strains included in the vaccine (only 2 to 5% of the 200 known strains), against genital warts and some dysplasias without specifying that there is no evidence that it protects against cancer. It states that some countries (USA, Sweden, Australia, Norway, Canada) achieve vaccine coverage rates that satisfy the shareholders of the vaccine manufacturers. “There are more than one hundred and twenty kinds of human papillomavirus (HPV), and fifteen are considered to be at high risk because they can cause cancers including HPV 16 and 18 causing 70% of infections.” But the only thing demonstrated is the statistical correlation between presence of papillomavirus and cancer, without anyone being so far able to demonstrate a direct CAUSALITY link. “There are effective vaccines against papillomavirus. In France, current vaccines offer effective vaccination against 70% of carcinogenic HPV, and a new vaccine will soon increase this rate to 90%. ” What does MPs mean by efficiency? the vaccine is effective on the infections of strains targeted by the vaccine (only 4 to 9 of the nearly 200 listed strains) but there is no evidence that it can prevent invasive cancer let alone avoid death by this cancer. Citing Australia as a vaccine success story: “In Australia, where 80% of women and 75% of men are vaccinated, cases of HPV lesions have almost disappeared” leaves you speechless, as the following presentation will show you, since in this highly vaccinated country the number of cervical cancer (as indeed the other cancers whose responsibility is attributed to HPV) continues to increase and the annual frequency of new cases does not decrease. Finally deny the risk of serious side effects that have led to protests in many countries (Denmark, Ireland, Japan, Colombia) and legal complaints from doctors against the European Medicines Agency, dreaming about the quality of the scientific file provided to MPs and soon to senators. The regular smear (every three years during periods of genital activity) better guarantor of early detection of cervical cancer. In France, papillomavirus infection is not a real public health problem in 2018, neither for women nor for men. In women, since smear screening has been used, the annual number of deaths from cervical cancer is consistently less than 1000 in France, and the women who die are almost exclusively those who have not. not practiced every three years. We must also congratulate the minister’s commitment (albeit very late) to promote this screening, which is the only one to date that has proven effective in reducing mortality . However, it should also prevent over-medicalization related to the diagnosis of ordinary papillomavirus infections but detected by systematic sampling that should be avoided! Positive, they too often lead to unnecessary surveillance by new exams and sometimes very early conisations, sometimes useless. Compliance with the indications of the conizations is necessary to avoid unjustified complications. Too much care can hurt your health! These less than 1000 deaths per year from cervical cancer, all of which could have been prevented by screening, compare with the annual burdens of lung cancer (23000 deaths), breast cancer in women (11 883 deaths), or cancer prostate (8207 deaths) . In contrast to the proven efficacy of smear screening, the Gardasil or Cervarix 12-year-old vaccines have yet to prove that they are able to prevent a single invasive cancer of the cervix. the uterus and the cancer registry records even suggest that this vaccine is sometimes likely to increase the risk. Curiously, the members who signed the bill do not talk about the proven results of the vaccine on the risk of invasive cancer of the cervix, its only official justification. Because instead of reducing the risk of invasive cancer of the cervix, HPV vaccines keep it at a high level or increase it! 2 °) Comparing the last standardized incidence world  to the HPV vaccination coverage rate in the different countries. In Australia, according to the Australian Institute of Health and Welfare, the incidence of cervical cancer declined by almost 50% from 12 in 1995 to 7 in 2004 (before the vaccination campaign) with a further decrease. increased mortality, thanks to smear screening and treatment progress. However, since the vaccination campaign started in 2007, there has been no further decrease in either incidence or mortality . In 2017, the incidence of cervical cancer is estimated at 7.1 and cervical cancer mortality has increased by almost 15% from 1.7 in 2014 to 2 in 2017 . ]. And our MPs quote Australian efficiency! The Australian Ministry of Health estimates the number of new cases of cervical cancer in 912 in 2017 and 930 in 2018. Claiming, like our MPs, that “cases of HPV lesions have almost disappeared” in Australia is therefore a counter-truth. ! As one can not imagine that these deputies lie voluntarily, we can conclude that they are poorly informed and that they should have checked themselves the information provided by the experts related to laboratories before distributing this “fake new” in a project of law. In Great Britain, according to Cancer Research UK, the Office of National Statistics, the incidence of cervical cancer had decreased (thanks to smear screening) from 12.4 in 1995 to 9.27 in 2004. 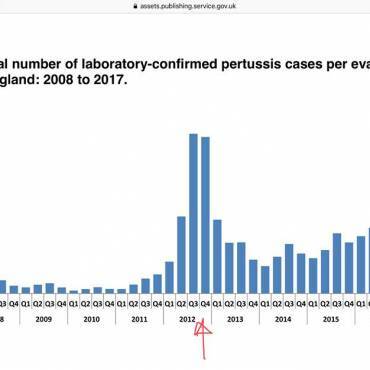 But since vaccination, there is no longer any evidence no progress, nor on the incidence stagnating from 9.3 in 2006 to 9.6 in 2015  nor on the remaining 3 mortality . In the United States, according to the National Cancer Institute’s SEER cancer statistics review, the incidence of cervical cancer increased from 14.8 in 1975 to 6.66 in 2007. But since vaccination, there has been no decrease in the incidence of cervical cancer. reached 6.68 in 2015 . In Norway, according to the Cancer Registry of Norway Oslo: before vaccination, the standardized incidence had fallen sharply thanks to smear screening from 24 in 1965 to 7 in 2004. But since the vaccination, it goes up to 13.9 in 2014 and 14.9 in 2015 [27). In Sweden, according to the National Kvalitetsregister for Cervix Cancerprevention (NKCx): before the vaccination campaign, the incidence of cervical cancer had decreased (thanks to screening) from 18 in 1967 to 7 in 2006 . In this country, the worldwide standardized incidence of cervical cancer has increased significantly since vaccination rose to 10.3 in 2012 and 11.49 in 2015 . This increase is almost exclusively due to the increase in the incidence of invasive cancer among women aged 23 to 49, which has reached more than 50% since 2006 (11 in 2006 versus 17 in 2015), whereas it is those who have the highest vaccination coverage rate (85%) . Thus, in countries whose populations have access to smear screening, it has everywhere led to a considerable reduction in the incidence of cervical cancer (from 40 to 60%) . In contrast, the introduction of vaccination has not reduced the incidence or mortality of cervical cancer, contrary to what is promised by laboratory-related physicians and by many global health authorities. And in the Nordic countries, vaccination campaigns have even been followed by an increase in the incidence of cancer. In this comparison, France, little vaccinated, can serve as a control country. According to Public Health France, the incidence of cervical cancer in mainland France has steadily decreased from 15 in 1995 to 7.5 in 2007, 6.7 in 2012 and 6 in 2017. This decrease in incidence was accompanied by a decrease in mortality from 5 in 1980 to 1.8 in 2012 and 1.7 in 2017 . 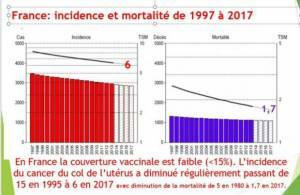 France, little vaccinated by the Gardasil, has therefore a much more satisfactory evolution for both incidence and mortality than that of the countries cited as an example by the deputies who want to impose vaccination. Immunization advocates claim that a high vaccination coverage rate reduces the risk of invasive cancer of the cervix. Yet the comparison of incidence and mortality rates with vaccine coverage rates shows the opposite. In Sweden the vaccination coverage rate is close to 75% but the incidence2015 reaches 11.49. In the USA, in 2017 the vaccination coverage rate is 60% for a cervical cancer incidence of 6.8 and a specific mortality at 2.3. In countries with high immunization coverage, the incidence of invasive cancers and mortality are therefore higher than in France, and the immunization obligation proposed by some members wants to eliminate this French paradox that protects our children! RETURN ON THE DELETER EFFECTS THAT CAN DIFFICULTLY BE DENYING OUR MEMBERS! In their preamble, the MEPs deny that Gardasil can lead (as any treatment) complications while Japan, Austria and Denmark have stopped promoting this vaccination after serious complications, sometimes even fatal and that families suffering from these vaccines organized public demonstrations in several countries of the world (Japan, Colombia, Ireland), and that Danish doctors lodged a complaint against the European Medicines Agency (EMA), which refused to answer the questions they asked. after the notification of severe neurological events not listed in the EMA registers. In France, several complaints are in progress . “Among the pathologies most frequently mentioned by the victims,” says Coubris, “include multiple sclerosis, lupus, acute disseminated encephalomyelitis (inflammation of the central nervous system) and macrophage myofasciitis (a disease that results in muscle aches and pains). and chronic fatigue). A parliamentary commission of inquiry which could hear experts, citizens and independent associations of laboratories, having, from near or far, no link of interest with laboratories, would be a first step to enlighten Parliament. IN CONCLUSION, the benefit-risk balance is not in favor of vaccination, let alone its obligation. A compulsory health measure should not be based on faith in vaccination or hidden conflicts of interest, but on proven facts, verifiable by every citizen. However, the facts established by the official records of cancer registries show that HPV vaccination does not protect against invasive cancer of the cervix, but seems rather maintain its frequency at a high level, and sometimes even increase it. Only this work of proximity of each citizen this summer, will be able to avoid this new catastrophe of return which could be the anti-HPV vaccination, as it has been and still is the obligation of vaccination against hepatitis B  .
Let’s apply the precautionary principle! Let us respect the right of every human being to dispose of his body! Qui a signé 124 conventions avec l’industrie pharmaceutique, dont 16 avec Sanofi Pasteur MSD et 3 avec GlaxoSmithKline, et a reçu en 4 ans 199 avantages financiers pour un montant de 40 550 euros, sans compter ses nombreux contrats commerciaux les plus rémunérateurs exclus par la loi de toute déclaration. Qui était néanmoins basse 3000 environ pour 65 millions de français et environ un peu plus de la moitié de femmes. 2017. Toronto, ON : Société canadienne du cancer ; 2017. Disponible à www.cancer.ca/statistiques. Cancer in Norway 2016 – Cancer incidence, mortality, survival and prevalence in Norway. Oslo : Cancer Registry of Norway, 2017. Voir les nombreuses contributions du docteur et expert auprès des tribunaux, Marc Girard sur son site http://www.rolandsimion.org/?lang=fr. « N’en déplaise à l’INSERM, les risques de la vaccination contre l’hépatite B ne relèvent pas d’idées reçues germées dans le cerveau dérangé d’anti-vaccinalistes irresponsables : dès 1991, des éléments technico-scientifiques clairs, précis et concordants ont été communiqués aux autorités sanitaires par le principal fabricant, conformément à la loi. Depuis lors, celles-ci n’ont eu de cesse de les occulter ou de les falsifier pour promouvoir l’idée reçue que l’introduction de cette vaccination était un progrès « évident ».